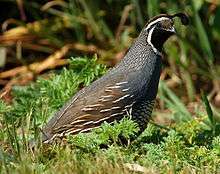 Callipepla is a genus of birds in the New World quail family, Odontophoridae. 1 2 3 "Callipepla". Integrated Taxonomic Information System. Retrieved 2010-09-28.